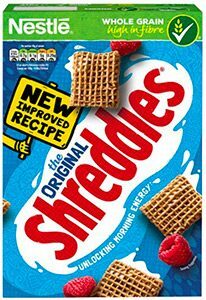 One of my favourite cereals that I must have is Shreddies. Over the years I haven’t noticed a change in the taste, at least since I’ve been eating them which is probably for almost 50 years now. I only eat Shreddies in hot milk, I know some people like to mix it up with dried fruit and other cereal with cold milk but this isn’t for me. So who has the better Shreddies? So, who wins in this contest? Yes, British Shreddies. 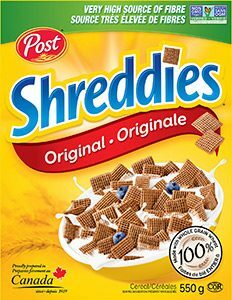 Canadian Shreddies coming in as a close second. 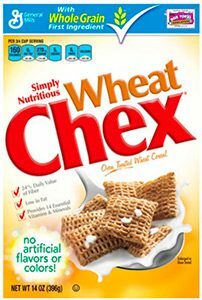 US Chex is third. Health care companies in the US are commercial enterprises who want to make money off their patients. Regular or hidden charges can build up or take you by surprise leaving you feeling ripped off and penniless. So, it’s really a good idea to be an “intelligent customer” to ensure you are getting your money’s worth. Here are some tips about avoiding larger charges that I have learnt. Try to get an estimate for the services you are going to use. There are two reasons for this: a) when your bill comes along and you think you have been overcharged you have a basis to question it, b) you can shop around to other places that will provide the same thing. Sometimes it’s very difficult to get an estimate from administrative staff so go through your own general practice if you can, they tend to be more helpful/competent. Stay within the network. Treatment outside of your insurance network will be much more expensive, obscenely so, ensure that whatever you are going to have done stays in-house. Always ask the price, whether you have got an estimate or not, prior to your treatment. I have been caught out thinking the service should be free, as in preventative, when days later I receive a huge bill. If something looks odd on your invoice then question it with the company. By doing this I found out that some companies don’t charge for a service that is less than $5. Use telehealth services. Often seeing the doctor face to face can mean a deductible or other charge. Consider using the companies telehealth service, that means to speak to a nurse on the phone or online. Often you can upload pictures so nurses can see the ailment to be checked out. Telehealth services might be free, check with your provider. When going to a practice observe how many people come to attend to you. It doesn’t take 5 nurses to take your blood pressure. I have always questioned why they provide multiple staff when it’s possible for one person to perform that simple task. Do you really need to see your doctor? Often a nurse can provide the service you need, this saves the doctor time and lowers your cost, probably. Question the price of medications. Buying drugs at your local pharmacy with GoodRx coupons could be cheaper than charging it to your insurance. This has been the case with all my medications. Often independent pharmacies are already linked to the GoodRx system. I hope you find these tips useful. They may not be relevant for all occasions but when doing business with a company that is providing a service you want to make sure you are getting a fair price for a high standard. Don’t be shy. Question everything. You are the customer. Upon a visit to our local pharmacy, I discovered how some Americans are buying their prescriptions up here in Canada, I did not realize they were allowed to do this. I learnt that American’s will drive up to Canada and visit Walk-In clinics specifically for a doctor there to write them a prescription. The clinic will confirm with the US-based Doctor that the prescription is legitimate and they need it according to their medical history. Americans will then visit a Canadian pharmacy to fill their medication. This happens a lot in the town where we live, Newton, British Columbia; I won’t mention the particular pharmacy but it is an international chain. Why do American’s do this? Canada buys drugs from pharmaceutical companies at an agreed rate which makes them much cheaper than the US. Therefore, American citizens will save themselves thousands of dollars by buying them this route. For example, 3 months supply of a branded medication in Canada will cost a months supply in the US. American citizens cannot afford their medication in the US so it’s cheaper to drive or fly up here to buy them. The US health care system is screwed up, and getting worse under Mr Trump, which leaves Americans without any choice to do this if they want to live. Americans will pay full price for their medication in Canada. Canadian’s get their health coverage from the universal system and pay their rate for medication. There is also extended health coverage in Canada, such as through private insurance, which makes it even cheaper. Even at the most expensive rate, Americans will still save money on their prescriptions. Technically it is illegal for US citizens to do this as they might be considered importing drugs which, according to the law, should only be done by manufacturers. From what I understand there some flexibility under that rule whereby the drugs must only be for personal use, no greater than 3 months supply and that particular brand/generic has been signed off by a US doctor. However, from what the pharmacy was suggesting the supply that the US citizens are buying in Canada go well beyond 3 months, in fact, they are buying thousands of dollars worth of medication in particular insulin. It’s very doubtful that American’s are declaring the drugs to customs officials when the cross the border. There is pressure from the US that the drugs bought overseas do not meet Federal Drug Administration (FDA) guidelines and can seriously affect the health of those buying them. Unfortunately, due to the prices in the US, it seems that people are willing to take that risk often not having any choice. If going through the proper process American’s should get 2 copies of a prescription from their local doctor, hand one into the Canadian pharmacy then declare all the necessary paperwork, including the copy of the prescription, to Customs and Border Patrol agents. However, people should understand the potential illegality of what they are doing. The US really needs to fix this situation so people don’t have to travel or rely on overseas countries. There will come a time when people won’t be able to travel, due to changes in age or ability, and should be able to buy decent priced medication in their local area. The US is supposed to be one of the richest countries in the world, you would think they can resolve something as easy as this. This feels like a “here we go again” with Mr Trump who makes inflammatory comments without thinking things through or have any facts to back them up. Trump supported Universal Health Care but since he ran as a President on the GOP ticket he has been against it. Its not the first time he has made anti-NHS statements when really he doesn’t know anything about it. He doesn’t form his opinion by normal methods, such as reading reports from advisors, but by snatching sound bytes through Fox News and this should not be a methodology that decides the future of the US. The NHS isn’t perfect and there is no healthcare system that is. The NHS are going through a tough period through various reasons such as short staffed due to Brexit and mis-management by the Conservative Party. The conservatives have always wanted to privatize parts of the NHS but so far hasn’t worked out very well, for example Virgin taking legal action against them for £2m for not winning a contract. However British people love the NHS and an attack by Mr Trump feels incredibly personal. Many countries have different needs and will have a model that supports that. So in reality the NHS or Canadian model might not meet the needs they have in the US. However, Americans tend to look at the UK to write off Universal Healthcare in the US even before discussions have taken place, and before any draft strategy documents are written up. This decision process, or the lack thereof, is heavily influenced by private companies in the US, big bucks going to legislators from healthcare and pharmaceutical companies. So, its very difficult to fight for universal healthcare, or even bring it to the discussion table, when Americans are being influenced by huge propaganda campaigns by these companies. Also, the US is an extremely divisive country right now, and has been prior to Trump, from one end of the spectrum to the other, in other words no one talks to each other. Its tough to get anything achieved in this environment. So, I don’t really know what will happen in the long term, certainly under Trump life will get worse for those with healthcare needs in particular rising prices. People might have some minimal advantages under the new tax reform bill but any money made there will be a drop in the ocean to pay the different in healthcare costs. 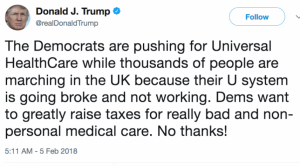 Blaming the NHS will get Trump nowhere except make the country more divisive which I assume must be on his agenda, the more chaos he creates the more he is on the news. I feel sorry for him and the American people.